Last month we talked about the 5 steps that could be done in your organization to initiate a strategic energy plan. This involved establishing a baseline, setting goals, measuring results, and monitoring progress moving forward. This month we’ll focus on specific ways to discover and resolve energy losses that are occurring in your buildings. We’ll also cover how Periscope contributes to quickly pinpointing these losses. While you could hire a firm to perform a detailed energy audit, it’s not necessarily the first thing you should do. Save some time and energy up front and identify obvious issues that could be causing problems by using Periscope to highlight these opportunities for improvement. When it comes to identifying energy loss in a facility, Periscope configured correctly will yield clues. What is the relationship between when people are working in a building vs when the building should be empty? A good rule of thumb is that off-hours energy use should be less than 20% of the occupied usage. Utilizing Periscope’s Heat Map, you should see a repeating pattern of lower usage after hours each night and weekends, and higher usage during the day. After a time, you’ll have a good sense of what percentage of a decrease you can expect between occupied states moving forward, and quickly identify if something has changed. If a spike in energy consumption is detected during an inactive period (nights/weekends) you can drill down into the data to the smallest sampling point and determine how much KW is cycling and for how long it’s on or off. 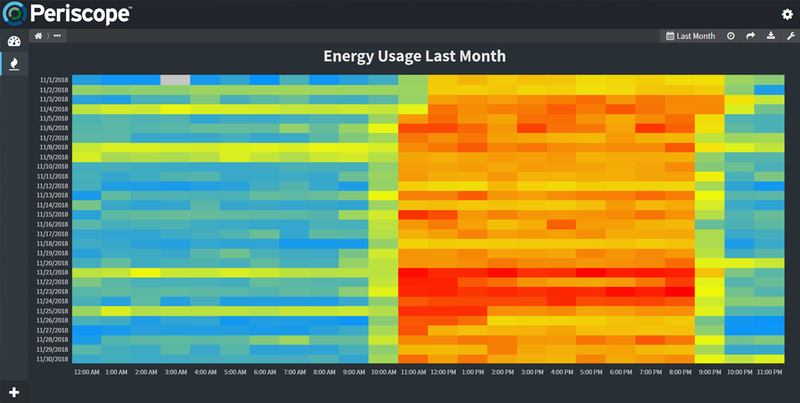 If your Heat Maps are structured based on building or floor, you should have a better notion for where the energy leak might be originating. Using Periscope you could monitor outdoor air economizer operation. Is your mixed air temperature optimized and controller properly to provide cooler air for free cooling of your building? You can trend and track your economizer function with Periscope to see how much fresh air is being brought into the building and ensure that it is optimized for your building requirements. If you’re using a fixed outdoor air drybulb setting for economizer operation, you should consider including outdoor air humidity in your control logic. Utilizing an outdoor enthalpy that is less than your return air enthalpy will ensure that you are maximizing the free cooling when required to meet space requirements. Is your facility equipped with make-up air heat exchangers? If your facility is exhausting inside air without replacing it with fresh air of a similar temperature via a heat exchanger, this could be adding a significant load on your HVAC system. Look for inconsistent temperature spreads with the Line Chart viewlet. This scenario occurs even if you aren’t having to use 100% outside air ventilation to meet your building use. With a 10 or 20% minimum outside air requirement in most buildings just to meet CO2 ventilation requirements, you are still dumping a lot of heated air in the winter needlessly. Consider installing a heat reclaim system to recover that heat and still provide the proper amount of fresh air ventilation to your building. Periscope can monitor motor or fan RPM with VFDs over time and compare those numbers to what should be considered normal. For optimal energy savings and equipment life, having fan motors run as slow as possible while still providing the necessary airflow for the application is ideal. Tracking your fan motor speeds historically will show how they are holding up over time. If you see a decline in RPMs under optimal speeds, this could be an indication of growing friction from dirty gear oil, increasing heat and shortening the life of the motor. Another negative effect from the suboptimal motor function can be an undesirable increase in room temperatures. Changing to clean synthetic oil can reduce motor wear and unwanted heat that would be added to the room. Gone are the days of scratching your head over what’s causing an energy drain at your facility. Periscope can be a frontline tool in monitoring energy usage and the health of your equipment. Not only will this extend the life of their function, it will also reduce operating costs. Let’s work together to optimize your building(s) performance! Next month for Part 3 of our discussion, we’ll provide examples of how Periscope can be custom tailored to provide valuable insight for different individuals within varied industries, businesses, and educational facilities.